What is another word for refuse? 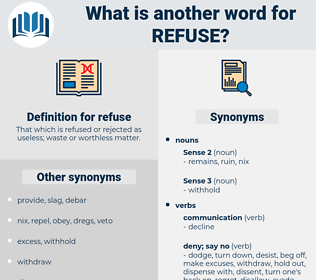 Refused, rebuffs, Refusing, refusal, refusals, garbage. turns, objects, Tailings, blocks, REFUS, rejection, rubbish, waste. unwillingness, junk, rejection, rubbish, debris, Littering, waste. are, AM, oppose, resist, disagree, waste. withhold, disallow, oppose, resist, refute, renounce, relinquish, render, repel, fails, forego, repulse, accept, resign, disqualify, discard, disagree, nullify, abstain, deprive, surrender, waste. cleanliness, sense, property, assets, possessions. retain, booty, intromit, gem, uphold, claim, plum, goody, trove, defend, avow, maintain, find, hold, catch, own, proclaim, treasure, acknowledge, valuable, advocate, pearl, salvage, cherish, jewel, vindicate, assert, prize. approve, meet, endorse, grant, agree, sanction, offer, face, allow, ok, consent. Here Betty could not refuse to look and be interested a little. Why did you refuse to answer all the questions put to you? rbc, Rara Avis, roebuck, ravehook, rabies, rooibos, rear back, rhapis, revise, revoke, repose, raphus, rubbish, rubbishy, raffish, roof peak, rhibhus, rubiaceae, refuge, Rebozo, ribes, ribose, rebecca, reface, rebekah, ribhus, rebus, ravish, reap hook, refugee, rubus, rebuke, ripsaw, refocus, ravage, Rubus Caesius, repechage, repossess, rapacious, rib cage. disobey, repudiate, pooh-pooh, reject, contract out, spurn, scorn, regret, disdain, turn down, freeze off.